If you need a word to describe the overnight cultural phenomenon that Pokémon GO has become, "Wow" is suitable. "Jeepers!" and "Aaaaaaah" are also acceptable. Word of mouth alone is enough to verify Pokémon GO is the biggest thing since Snorlax. Everyone is mad into it, sometimes to the point of forgetting their basic sense of decency. 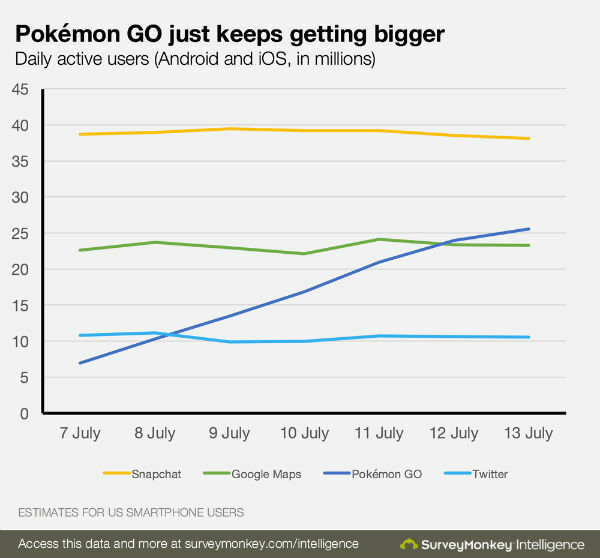 But if you need the data to back up Pokémon GO's impact, mobile data tracking service SurveyMonkey Intelligence has you covered. The numbers are, to quote SurveyMonkey reporter Robbie Allan, "very impressive." "We estimate that yesterday [July 14] just under 26 million Americans played Pokémon GO on Android and iOS," Allan writes. "This is unprecedented for a mobile game, and makes it a top 10 app by daily active users. More people use the maps in Pokémon GO (which is powered by Google Maps) than use Google Maps itself." But as Allan points out, an app's initial download numbers are only a fraction of the story. What really counts is how many people keep that app or game on their phone or device, then use it daily. 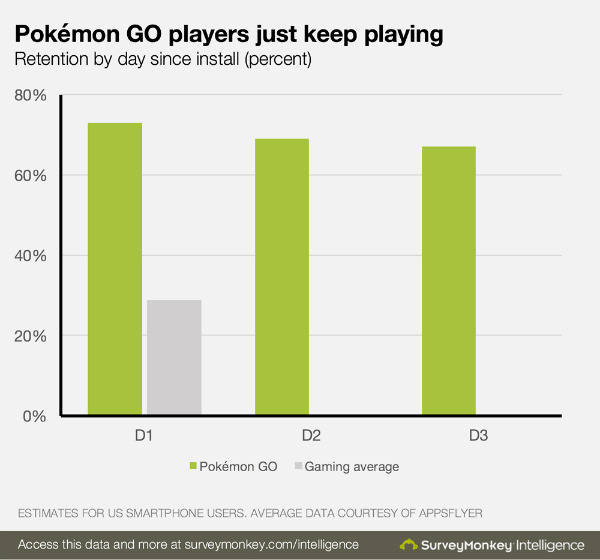 So far, Pokémon GO's retention numbers are almost unprecedented. Approximately seven out of ten users return to the game the day after downloading it. "For context, the average rate of next-day return (usually termed 'D1 retention') for games is closer to three out of ten returners," Allan writes. "We asked an experienced mobile games industry executive for a reaction to this data, and he responded, 'I’ve never seen anything close to that. Phenomenal.' (This person asked not to be named, since mobile game companies closely guard their retention data.)" The next question people ask about a popular free-to-play game is, "Does it make any money?" So, how about it? Is Pokémon GO making bank? Does a Pikachu eat Oran berries in the woods? "We estimate Pokémon GO's average revenue per daily active user (ARPDAU) at around $0.25," says Allan. "This is twice the average for casual games, and higher than even the famously profitable Candy Crush Saga. That is incredible." It should be mentioned that Miitomo demonstrated strong user retention at first, but it dropped off quite quickly. Though the world is eating and breathing Pokémon GO at this specific point in time, popularity is a fickle thing. Pokémon GO might be a punchline this time next month. But I'd lay down stronger odds that Nintendo, Niantic, and The Pokémon Company are onto something huge here. Whereas Miitomo is built around a single concept that people got tired of pretty quickly, Pokémon GO's potential for growth is very exciting. If the parties involved with the game stay on top of it, I don't foresee "Hey, remember when we all went nuts over Pokémon GO for, like, five minutes?" becoming a common conversation topic half a year from now. Granted, the hype will eventually die down enough so that kids will remember to look both ways before darting across the street to catch a Pidgey, but that's not exactly a bad thing. Tagged with Android Devices,	ios,	MMOs,	News,	Niantic,	Nintendo,	Pokemon,	The Pokemon Company.